My Favorite Husband was first broadcast as a one-time special on CBS Radio on July 5, 1948. CBS's new series Our Miss Brooks had been delayed coming to the air, so to fill in the gap that week CBS aired the audition program (the radio equivalent of a television pilot) for My Favorite Husband. Lucille Ball and Lee Bowman played the characters of Liz and George Cugat, and a positive response to this broadcast convinced CBS to launch My Favorite Husband as a series. 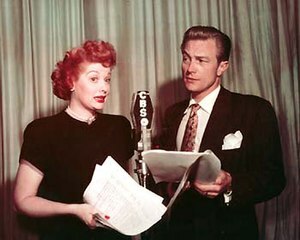 Bowman was not available to do the series, so when it debuted later that month it starred Lucille Ball and Richard Denning as the leads. The couple lived at 321 Bundy Drive in the fictitious city of Sheridan Falls, and were billed as, "two people who live together and like it." The episode would progress into a minor crisis or problem, typically caused by one of Liz' zany ideas. Each episode would end with the problem solved and Liz saying, "Thanks, George. You're my favorite husband." Bob LeMond: It's time for My Favorite Husband starring Lucille Ball! Jell-O tapioca pudding, yes sir-ee! LeMond: And now, Lucille Ball with Richard Denning as Liz and George Cooper, two people who live together and like it. A total of 124 episodes of the program aired from July 23, 1948 through March 31, 1951. It was initially written by Frank Fox and Bill Davenport, who were the writers for radio's Ozzie and Harriet. The show portrayed the Cugats as a well-to-do banker and his socially prominent wife. That fall, after about ten episodes had been written, Fox and Davenport departed and three new writers took over—Bob Carroll, Jr., Madelyn Pugh, and head writer/producer Jess Oppenheimer. They subsequently changed the couple's name to Cooper and remade them into a middle-class couple, which they thought average listeners would find more accessible. In March 1949 Gale Gordon took over the existing role of George's boss, Rudolph Atterbury, and Bea Benederet was added as his wife, Iris. One discovery made during the run of the show was that Lucille Ball performed comedy far better when she played to an audience. Mr. Rudolph Atterbury, played first by Hans Conried and then Joseph Kearns, and in subsequent episodes by Gale Gordon; George's boss, friend of the Cooper family, often refers to George as "boy," as in "George-Boy"
Mrs. Iris Atterbury, played by Bea Benaderet; wife of Rudolph and friend of the Cooper family, often refers to Liz as "girl," as in "Liz-Girl"
In 1950 Lucille Ball was asked to do a television version of the show, and CBS and Jell-O both insisted that Richard Denning continue as her co-star. Ball refused to do it without real-life husband Desi Arnaz playing her on-screen husband. The network reluctantly agreed, and the concept was reworked into I Love Lucy after Ball and Arnaz took a show on the road to convince the network that audiences would respond. Jell-O dropped out and Philip Morris became the television sponsor. Gale Gordon and Bea Benaderet, who played the Atterburys, were both given first consideration for the roles that would become Fred and Ethel Mertz on I Love Lucy, but both had contract conflicts that forced them to turn down the roles. CBS brought My Favorite Husband to television in 1953, starring Joan Caulfield and Barry Nelson as Liz and George Cooper. The couple now resembled their earliest radio version, with George Cooper a well-to-do bank executive and with plots dealing with the couple's society life. The television version ran two-and-a-half seasons, from September 1953 through December 1955, and was produced live at CBS Television City for most of its run, until switching to film for a truncated third season filmed at Desilu and recasting Liz Cooper with Vanessa Brown. Though the radio show was never commercially released on its own CD or DVD collections, at least one episode can be found on each disk from the I Love Lucy DVD releases. In 2003, two episodes were released together on a CD in the UK. These radio episodes are in the public domain, and CDs containing the entire run of My Favorite Husband in the MP3 format are legally offered by several private vendors through eBay and other sites, such as at the public domain repository, the Internet Archive. ^ a b c d e f g Monush, Barry; Sheridan, James (2011). "My Favorite Husband: Background". Lucille Ball FAQ: Everything Left to Know About America's Favorite Redhead. Applause Theatre & Cinema Books. ISBN 978-1-61774-082-4. Retrieved 2017-05-31. ^ a b Sanders, Coyne; Gilbert, Tom (1993). Desilu: The Story of Lucille Ball and Desi Arnaz. Harper Collins. pp. 23–25. ISBN 0-688-13514-5. Retrieved 2017-05-31. ^ Sanders, Coyne; Gilbert, Tom (1993). Desilu: The Story of Lucille Ball and Desi Arnaz. Harper Collins. p. 40. ISBN 0-688-13514-5. Retrieved 2017-05-31. ^ Andrews, Bart (1976). Lucy & Ricky & Fred & Ethel: The Story of "I Love Lucy". Dutton. p. 13. ISBN 0525149902. Retrieved 2017-05-27. ^ Karol, Michael (2006). Sitcom Queens: Divas of the Small Screen. iUniverse, Inc. p. 16. ISBN 0-595-40251-8. Retrieved 2017-05-27. ^ Andrews, Bart (1985). The "I Love Lucy" Book. Doubleday. p. 47. ISBN 0-385-19033-6. ^ a b Brooks, Tim; Marsh, Earle (2007). The Complete Directory to Prime Time Network and Cable TV Shows - 1946-Present (9 ed.). Ballantine Books. p. 940. ISBN 978-0-345-49773-4. Retrieved 2017-05-27. ^ Monush, Barry (2003). "Joan Caulfield". Screen World Presents: The Encyclopedia of Hollywood Screen Stars From the Silent Era to 1965. Applause Theatre and Cinema Books. p. 119. ISBN 1-55783-551-9. Retrieved 2017-05-27. My Favorite Husband episodes with notes including which corresponding I Love Lucy episode it spawned.